DSquared2 is a brand that is well known for their fashion NOT for their perfumes. I don’t have much experience with the line (I have only tried He Wood and the less said about that the better) but what I do know is that each of their perfumes has an awful clanger of a name, they include; He Wood, She Wood and He Wood Rocky Mountain Wood…. Yes, those truly awful names, and a bad experience with He Wood led me to believe that I wouldn’t like Potion, in fact I was prepared to actively dislike it. So imagine my surprise when a chance encounter with a sample would reveal that this Potion, isn’t half bad at all. Potion starts warm and spicy, the top notes are full of cinnamon, and something herbaceous that I can’t quite put my finger on, it could be basil. Cinnamon is my note du jour, I loved its use in Ambre Narguilé by Hermés, and whilst it’s presence is much more subdued in Potion, it adds a nice foody edge to the spices. As Potion progresses it becomes much smokier and despite no incense note being listed I do detect a hefty amount in the heart. The spice subdues and the balance shifts towards the woody facet, which is cosy soft. I could swear that there is a touch of something oud-like in the heart, every now and then there is a hint of the sour/funky stuff, but it really is just a touch. Then we get to the base. Most mainstream masculines would normally derail for me at this point, they would veer off towards a harsh cedar dry down that I would inevitably hate and then moan about. Luckily for me, Potion avoids the usual train wreck and decides to follow a cosier, amber and musk route that is warm and spicy. There is nothing harsh in the base whatsoever, the smoke, which has nearly disappeared is tamed by a warm tonka note which comes complete with a nice boozy edge. 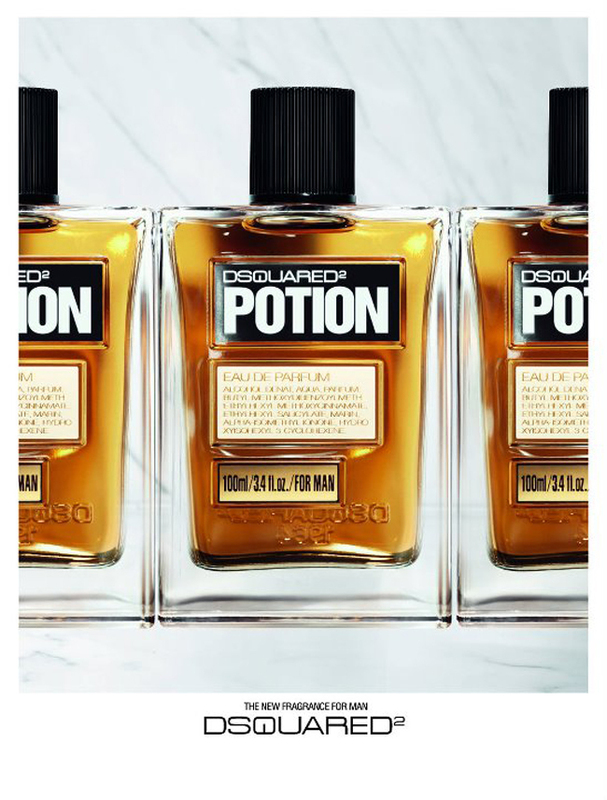 Where Potion disappoints is its longevity, it wears very close to the skin for an Eau de Parfum and lasts a maximum of three hours on my skin. I would have possibly been tempted to buy a bottle of Potion if it weren’t for the ultra naff longevity, I could even put up with the fact it doesn’t project very much (sometimes, on rare occasions, I feel like wearing a ‘quiet’ scent) but I just can’t forgive the epic fail in terms of longevity. Potion is a warm, woody amber with hints of spice and musk. It’s absolutely nothing new BUT it does smell good, and if you’re in the market for a warm, woody amber then I think you should definitely give Potion a try, it’s reasonably priced and has kind of impressed this sceptical perfumista. Kudos also has to be given to DSquared2 for releasing a masculine EDP in the mainstream market. DSquared2 Potion is available in 50ml and 100ml Eau de Parfum, prices range from £42.50-£57 and matching body products are also available. This review is based on a sample of Potion obtained in Harvey Nichols. Lyrics from the Kate Bush song ‘How to be Invisible’. Posted in DSquared2, Masculine, Oriental, Woody and tagged DSquared2, Masculine, Oriental, Perfume Review, Potion, Woody. Bookmark the permalink. I hate that fake-recipe style marketing ploy, gah! Hand-blended cashmere wood – I ask you! Tell me about it – it’s very tacky! We all have the odd 1/2 cup of amber lying around…. Potion sounds like it’s been a curve-ball for you. Haven’t spied it as of it but will be on alert. Haha – you’ve got to love Ab Fab. He Wood just wasn’t for me at all, it was too harsh and woody. I too have a real fondness for He Wood. What can I say? It’s one of the few vetiver fragrances I like. Totally linear, totally synthetic and I don’t care. Chalk another on the “ingredient list” hater column. Cringeworthy. I actually had to laugh out loud at the names of the other fragrances. I think He Wood Rocky Mountain Wood may be worse than Chanel Allure Homme Sport Cologne Sport. Not tried this one so can’t add much to the discussion there, but I’ll give it a sniff next time. I hope it’s a lot better than the dreadful He Wood! Oh dear, the list of ingredients seems to be a tad unpopular! He Wood Rocky Mountain Wood is the dumbest name ever. You should try this – it’s MUCH better than He Wood. It can be found in Harvey Nichols. I LOVE those tacky bottle labels – straight out of the 70s!! I’m quite intrigued by your descriptions. It sounds rather warm and cozy with its smoke and spices. The labels are really retro aren’t they. It’s a nice enough scent, just a bit disappointing with its longevity. Isn’t Kate Bush just all kinds of awesome?